No one will ever be able to say the Vanderlist family vinyl collection is overwhelming. It’s diverse to say the least, but that has more to do with them being picked up solely for use in a photo shoot by my wife versus played. Actually, we don’t even own a turntable, so even if we wanted to listen we’d have to take them to a friend’s house. Regardless, the lack of a full collection (or a player) is no reason they can’t be displayed well. I first saw this project on Pintrest, so it’s not an original design, but it was a lot of fun to make. It’s easy to customize and add your own little twists too. 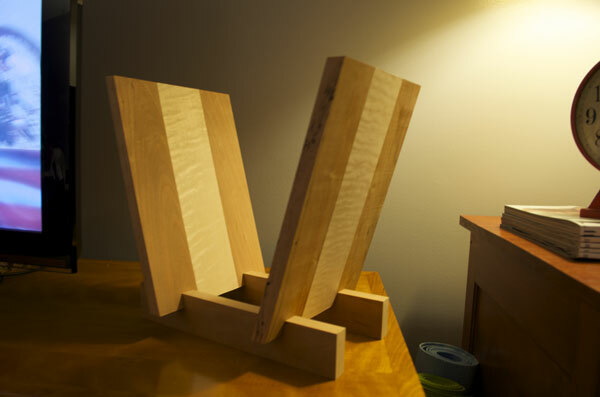 Whether it’s varying the species of wood used, the length of the base, or the height and shape of the supports it’s easy to make it uniquely your own.